The Samsung Galaxy Note is Samsung's answer to Apple's iPad - a 10.1" display tablet running on Android, enabling users to surf the web, check e-mails, download apps, and much much more. At 583g in weight, and measuring just 25cm by 17cm by 1cm, it is highly portable - enabling you to easily fit it into your bag and use whilst out and about. But how does it measure up to the competition? Read on for our review of the Samsung Galaxy Note tablet. Below is our review of the Samsung Galaxy Note, a 10.1" tablet, featuring a 1.4GHz processor and 2GB memory, with approximately 6 hours battery life. The Samsung Galaxy Note tablet features a clear 10.1" screen, and weights approximately 583g - thus being small, light and portable enough for those who have to commute, students, and others who are out and about. Battery life is excellent - unlike other tablets, this seemed to last a long time between charges, we cannot fault the Galaxy Note tablet in this department - if you plan on using this tablet whilst on the move then this will be ideal for your needs. The large screen offers clear viewing, and is highly responsive to input - we found it easy to navigate either by fingers, or the "pen" supplied, which is ideal for use when accuracy is a priority. The viewing angles of this tablet are good - so ideal for when sat with friends, or showing presentations to larger groups - and the colours are especially vibrant. The tablet was fast to connect to Wi-Fi, and performed well - web browsing and downloading was fast - even on script heavy web pages, the tablet ran smoothly - and then pen made navigating easy and accurate. Build quality and overall construction feels good - as you'd expect from a major manufacturer such as Samsung, who have vast expertise in manufacturing electronic and computing products, especially considering their cutting edge mobile phone and laptops products. To increase storage space, you can easily order a 32gb MicroSD card, thus making this device future proof to a certain degree. It seems that the Galaxy Note won't (at time of writing) accept 64GB MicroSD cards - so you will be limited to 32GB of external storage. Audio quality is very good, especially considering the small overall size and weight of this tablet - you may wish to wear headphones for privacy reasons if out and about - however the speakers cannot be faulted. Another remarkable feature of this tablet is a split screen feature - enabling you to multitask without having to flick between windows - this saves a lot of time and effort, and one that our testers greatly appreciated. The GPS feature doesn't require an internet connection - thus is suitable for using in the car whilst away from Wi-Fi connections - it is quick to connect and very accurate to use. Pros: Performs great, easy to use and upgrade the memory, the pen and the multi-tasking features and built in GPS are great additions. Cons: None to speak of - we couldn't fault it. 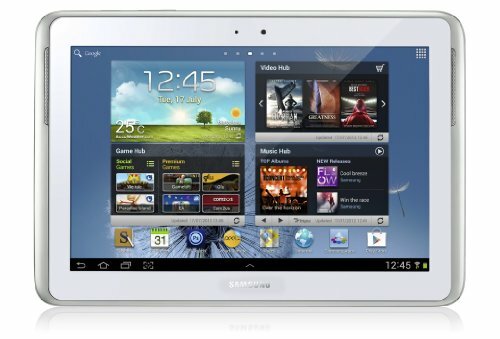 A feature packed 10.1" tablet from Samsung at a very competitive price - several handy features, such as the GPS, multitasking and the pen make this tablet stand out in a competitive market.